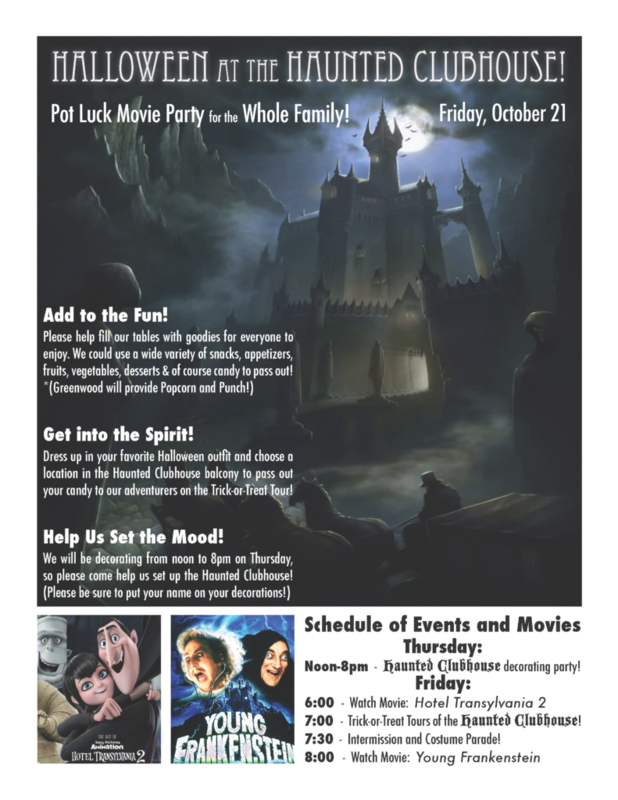 Halloween Pot Luck Movie Party For the Whole Family at the Haunted Clubhouse. Please help fill our tables with goodies for everyone to enjoy. Dress up in your favorite Halloween outfit and pick a location upstairs in the Haunted area of the Clubhouse to pass out your candy to our Adventurers on the Trick-or-Treat Tour. Everyone is Encouraged to wear Halloween Costumes! Noon to 6 pm – HAUNTED CLUBHO– USE Decorating Party, come join the fun! At 6:00 pm – Watch “HOTEL TRANSYLVANIA 2”. PS. Help set the Mood: Come to the Thursday Clubhouse Decorating Party from noon to 8 pm.